MCFC Ring in the Year of the Monkey with a BANG! Manchester City Football Club are gearing up for a festive February with their biggest and best Chinese New Year celebrations yet as they offer fans a range of unique and engaging opportunities to get involved in what is quickly becoming a marquee event for all across the globe. The Year of the Monkey officially begins on 8 February 2016, but Manchester City fans won’t have to wait that long to celebrate. The Club, an official sponsor of Manchester’s Chinese New Year Celebrations, go head to head with Leicester City FC at the Etihad Stadium on Saturday, 6 February and the activity taking place off the pitch is expected to be as captivating as the game itself. From 11:00am on matchday fans will be treated to eye-catching performances by professional Chinese lion dancers and acrobats in City Square, the Etihad Stadium’s iconic pre-match venue, and will also have the opportunity to get their hands on exclusive MCFC fortune cookies filled with more than just your run-of-the-mill lucky New Year messages. This year City fans will be in for a chance of winning a range of money-can’t-buy prizes when they crack their fortune cookies open, from free beverages to signed merchandise and unforgettable Blue Carpet experiences, this is yet another can’t miss matchday opportunity for any City supporter. 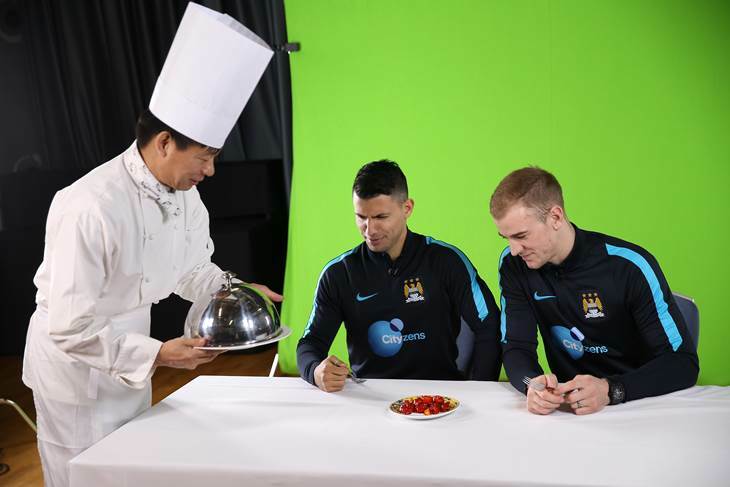 This Lunar New Year Manchester City fans can also tune in to CityTV’s official YouTube channel, as well as MCFC’s official Facebook, Twitter and Instagram pages, to catch Sergio Agüero, Kevin de Bruyne, Fabian Delph and Joe Hart savouring a range of traditional Chinese dishes. The first instalment of the special Lunar New Year video series, which encompasses four video features, witnesses the players coming face-to-face with a selection of dishes they’ve never seen before and their reactions are not to be missed. The follow-up video airing on New Year’s Day, 8 February, will feature a demanding ‘chopstick challenge’ that really puts the players’ ball skills to the test making this another unforgettable CityTV production. Manchester’s Chinese New Year celebrations kicked off last night, 4 February, with a stunning 3D light show at St. Anne’s Square in the city centre, the same day Manchester City launched their inaugural Mandarin Club and Stadium tour. Taking place at 3:00pm from 4-8 February (excluding 6 February) and becoming a permanent offering from the Club as of 3 April, the new tour will provide Mandarin-speaking visitors with the opportunity to get closer than ever to all of Manchester City’s exclusive, behind-the-scenes action. The Club hope this new feature will help put Manchester on the map as a premier UK destination for all. As part of their Chinese New Year celebrations, Manchester City are also delighted to announce that this summer they will be playing in China during their annual pre-season tour, participating once again in the International Champions Cup (ICC). More details to be announced in due course. Manchester City’s sister clubs, New York City FC and Melbourne City FC, will also host a series of exciting and innovative matchday activations over the next month. The three clubs, who are wholly owned by the City Football Group, a 13% stake of which was acquired by a China Media Capital-led consortium in December 2015, want to ensure their fans near and far not only have access to the most unique matchday experiences, but that they can also share memorable experiences and momentous occasions together through the medium of football, even if thousands of miles apart.